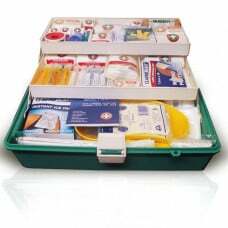 Our K407 First Aid Kit is recommended for the youth / junior team with minimal contact. The K407 is designed for sports teams to be used by the team physio or manger. It covers your duty of care for most sports - football, soccer, hockey, skating, cycling, cricket, athletics, swimming, boxing, basketball and many more. - Our First Aid kits have tough, durable cases, and provide the ultimate for treating sports injuries. - Sports Medical Association (SMA) recommendations were consulted when building these First Aid kits.